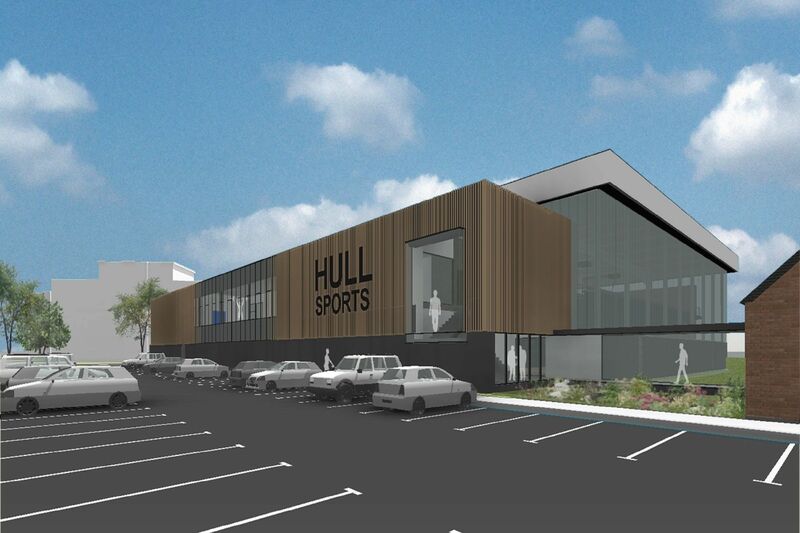 The University of Hull’s new sports centre is set to be the largest sports facility in the region. With a development budget of £16m the University of Hull, appointed Space Architects to conduct a comprehensive options study and then in conjunction with Project Managers Gardiner & Theobald, to develop the concept design for the new sports centre within an affordable cost envelope. The importance of the development has attracted attention from two notable bodies who have granted funding to the tune of £750k. This is made up of £500k from the FA and Premier Leagues Facilities Fund, and £250k from the Rugby Football Union (RFU). The project, led by Mike Varlow of Space Architects came into being following the University’s Strategy for Sport, released in 2016. This strategy shaped the University’s vision and mission going forward to 2020, but it ultimately determined that the existing sports centre was no longer fit for purpose and couldn’t deliver to meet the standards of their future plans. The strategy confirms the University’s commitment to sport and active recreation at all levels, with a focus on participation, well-being, sustainability, competition and performance. The new sports facility will incorporate a 12 court, competition standard sports hall with bleacher seating for 750 spectators, a 30 station strength and conditioning gym, and changing and support facilities in a separate pavilion. The new sports centre will open in the summer of 2018 before work begins to refurbish the existing listed sports building, ensuring continuity of the sporting facilities. Plus there will be a new 3G pitch, complying to International Rugby standards – the only one in the region. The existing sports hall will be refurbished to provide a 120 station fitness gym, two aerobics/spin studios, a martial arts combat gym and revamped changing facilities. This forms Phase 2 of the development and will be completed in July 2019. The new sports hall will be a first class sports facility offering the full range of Sport England court sports, generating student appeal and attracting commercial interest as an event space and host venue for elite or international sport events. An important aspect of the development was that it be designed to meet International level netball standards. The client outlined their desire for a facility that was functional yet inviting and stressed the importance of it not feeling like a ‘run-of-the-mill’ sports hall. Initially, Space Architects carried out an in-depth feasibility study to generate the required assessments in a structured way. After gaining client approval, the design and project team began work on the refurbishment and remodelling of the sports centre to transform it into a 21st Century sports development. The design team also had to adhere to Sport England Guidelines and ensure they followed government guidelines on training facilities. The existing sports hall building was awarded a Grade II listing during the design process which meant that the development had to preserve its historical significance and context. Space Architects have a wealth of experience of developing listed buildings and adapted the original design to create the new facilities. The new sports hall is now a modern homage to the existing building that is fit for purpose and meets the University’s sports strategy vision. Space Architects devised a sophisticated assisted natural ventilation system in the sports hall, to capture unwanted solar gain that can be exhausted in the summer but used in winter to heat the hall space. This was designed in conjunction with rooftop wind catchers, removing the need for mechanical cooling. Including these measures into the design of the hall provides a cost-effective and sustainable solution to moderate internal temperatures and humidity, in addition to improved comfort for all occupants. Work is progressing well, and the changing pavilion and sports pitches that formed an early phase of the development are in the final stages of hand over to the client. There are more than 50 sporting teams representing the University, and this investment is a commitment to supporting their development and a step towards realising the vision for a top-level sporting University. The new facilities will boost the quality and size of facilities on offer at the University to meet a rising level of demand among students, as well as offering a high-quality sporting provision for visiting teams and the wider community.